*sigh* We HAD a robust outdoor program but the youth (influenced by their parents) CHOSE to abandon it. We used to find room for both but after the wheels fall off this year will have to start rebuilding again (...and this was suppose to be a rebuilding year.) Anyway next topic. That would be a good next topic - how to get indoor parents enthused for an overnight, outdoor program. When in doubt ask Bill! 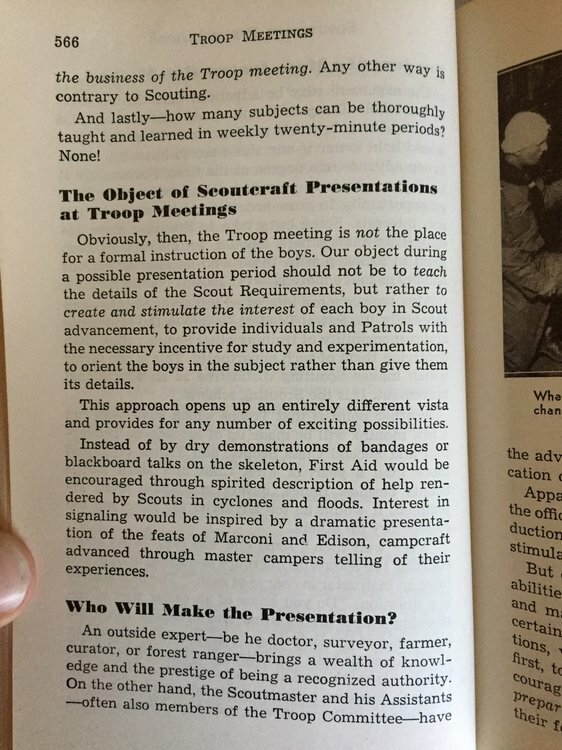 From the Handbook for Scoutmasters, 3rd edition, 1938, Vol. 2. In so many ways, don’t we wish “modern” Scouting still resembled 1938. That's my wish. And is there enough magic out there in the moonlight to make this dream come true? 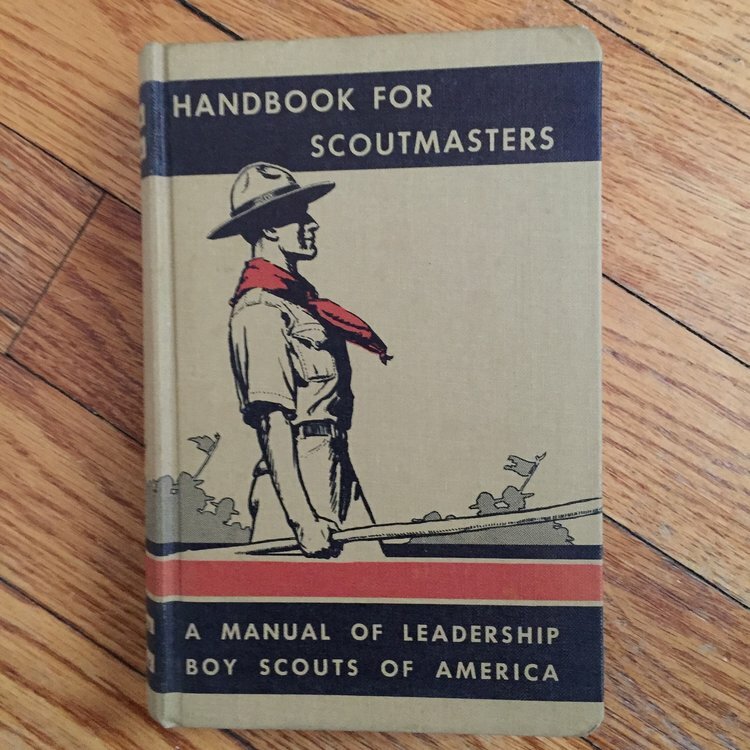 I asked for the 1938 vol 1&2 for a gift from my Scouts. I thoroughly enjoy reading them and taking notes. We will be getting back to the basics. The Scouts will also be learning who GBB was and his impact on scouting. The books feel like a time machine. And is there enough magic out there in the moonlight to make this dream come true? Being realistic - not pessimistic ... I don't think Mr. Surbaugh shares your dream. We have a number of parents who teach classes. Some of those meet before the troop meeting, some at a time convenient to all. Most meet every couple of weeks for a couple of months. This has worked really well - we normally have 8-10 such classes a year. I think the key for us is that we almost never teach merit badges at a troop meeting. That's what our troop does too. We hold them before troop meetings so those who have done them already/not interested don't need to participate. Sometimes we hold sessions during weekends or breaks. We run about 4-6 per year. Some kids are really into doing MB's but most aren't. However, most are used to the grind so they'll do it if they're pushed. But, there's enough fun stuff to balance it out. Hey - my book has the same pages!!! Thank you, on this morning of merit badge mill melancholy I open my browser to a big bowl of Green Bar Bill awesome. Warms the soul. Note to self: NEVER lend out my SMHB 3rd ed Vols 1 and 2. It won't come back home. What I find interesting about these pics is that BSA is now promoting the Troop Program Features, where instruction is divided into 3 ability groups. Grant you, my old troop used WOODS WISDOM, as a basis for our meeting plans, but taught by patrols. 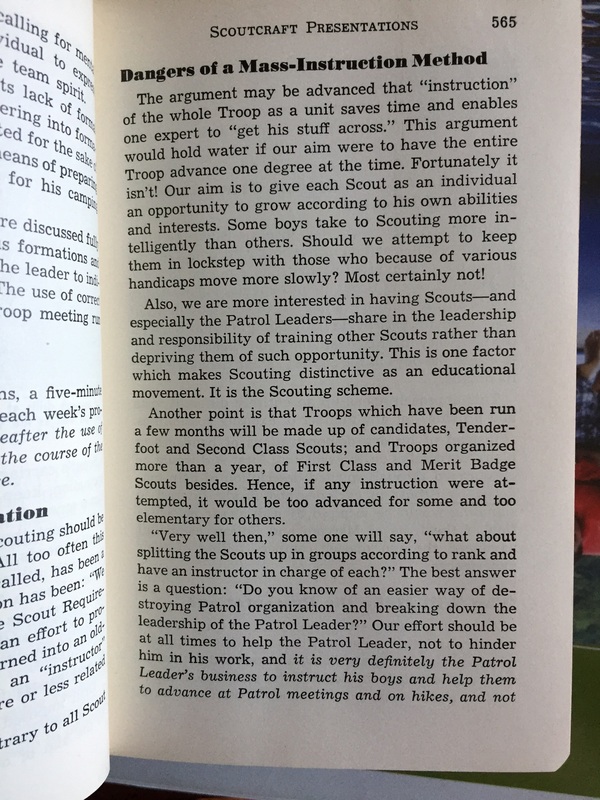 PLs, knowledgeable Scouts in the patrol, but most often older Scouts in the Leadership Corps did the instruction. Our troop hated mb sessions during meetings. In fact we had several spls give speeches during elections on how we’d spend more time outside than doing advancement work. These guys won all the time. If you left it to my troop we’d never do advancement work at meetings. Maybe on camp outs but only if it was part of a scheduled activity. The kids are not the ones pushing mb work. It was usually just one or two adults. Usually the parents of kids who wanted their kid to make Eagle fast. And as said before, only a few actually pay attention and do all the requirements. Advancement is a issue in our troop as well. All they want to do is play games. The best way we have fixed it is the ASM (we only have one active one), and usually the SPL (me) or the Guide and we sit down one by one with the scouts who have their books. If they don’t have their books, then it’s their missed opportunity. Anyway, we basically guide them along. If needed, we teach them requirement(s) and then they come back after practicing, demonstrate the skills (orally or physically), and then that requirement is done. When we did try MBs, nobody paid attention (myself and another person did), and now we are one step closer than the rest because they decided to talk. OK, I need to get a copy for myself. Which version should I look for? Think he is suggesting this one.